I used to design products based on my experience, intuition and discussions with my project manager, engineers and other designers. We didn’t do much research. We looked at what our users were asking for (rarely a good idea), what we wanted to build and then we built it and moved on. After some time we might have looked at some metrics to see if it’s used or not. Looking back now, that seems crazy. How did we know if we were actually solving a real problem our customers were having? And even if we did, how could we have known that we had actually solved it? Something I learned quickly at Intercom was that I can’t base my work on assumptions and guesswork if I want to be confident in my designs. I need to base it on data and evidence of real customer needs and problems. Fortunately for the design team at Intercom, the same product that we’re designing can be used to design it. I’ll walk you through two examples of how I’ve used Intercom to come up with better design solutions. Everyone at Intercom is constantly talking to our users. We’re reaching out to provide them with product education, answering their questions and hearing their feedback. Customer feedback is one of the main inputs into our roadmap. But you can’t always take it at face value. Users are experts at their problems, but not the solutions. So to better understand customer feedback, our support team tags all feature requests and conversations where our users are confused by how something works with the responsible team. Then the research team organizes them by topic. What we end up with is a list of common things our customers talk about and links to conversations about them. If we decide to tackle one of the feature requests or improve a product area that we know causes confusion, we can go through existing conversations to better understand them and reach out if we’ve got more questions. For example, the ability to have a conversation with multiple people at once is a common feature request we get. We often received requests to add the ability to CC or BCC someone. Customers often use language that’s familiar to them and their experience with other systems (in this case, email). This tells us what feature they want, but not necessarily why. So, when we decided to tackle this problem I analyzed 120 latest conversations that mention these terms to better understand why our users need them. If it wasn’t clear in their initial message I would reach out to further clarify the underlying problem they’re trying to solve. What I found was that their feedback was actually quite diverse. Only 33% wanted to have a conversation with multiple people at once. Others wanted to hand off the conversation to someone else by first introducing them or move the conversation to another system. Without doing this research, a reasonable assumption could have been that we needed to add the ability to have conversations with multiple people at once. But now we know that we also need to improve our process for handing off conversations and moving conversations to other systems. 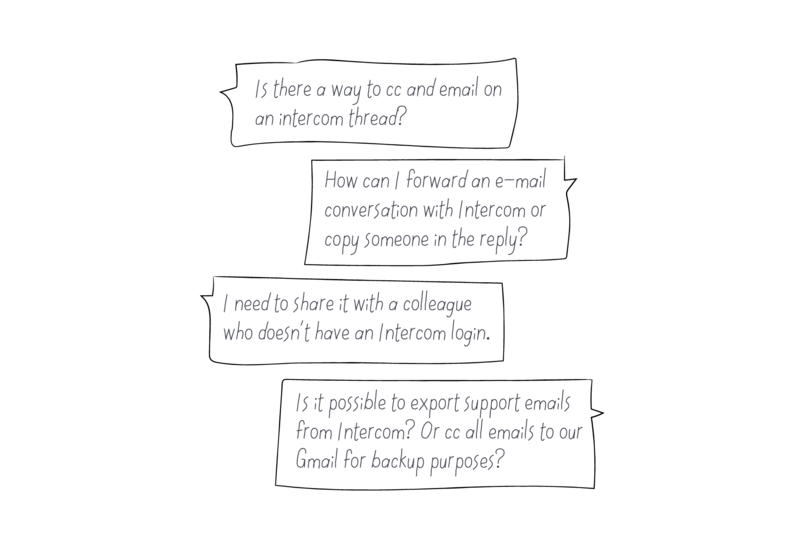 In Intercom our users have two different tools for sending messages. One of them is meant for messaging large sets of users. It has quite a few features to do that effectively, so it’s designed to walk you through the process and make it feel safe. In addition to that we also have a feature that’s meant for quick 1:1 messages and it’s designed to be fast and simple. We noticed that 30% of messages sent through the fully featured message editor were 1:1 messages. This meant that our intentions didn’t align with our users’ needs. 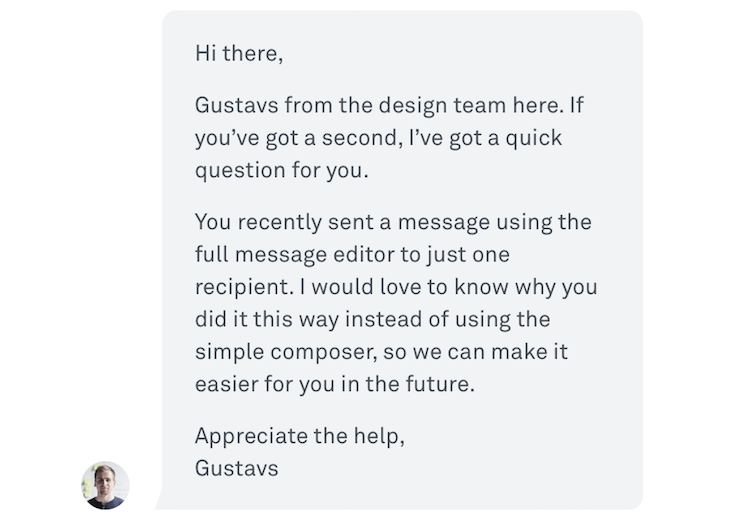 To better understand why I setup a quick auto message on Intercom targeting people who had just sent a 1:1 message using the fully featured message editor and asked them why they used this instead of the faster and simpler 1:1 message composer. Within a few hours I found out that the vast majority did this because they could reuse an existing message by duplicating it. This wasn’t possible with the simple message composer. By asking this question straight after our users sent their message I could talk to right people in a moment when this was fresh in their minds. As a designer, your product intuition is an extremely valuable skill, but so too is staying in touch with the needs of your users. Getting direct access to user feedback guides and informs your decision-making as you design and influences your product roadmap. Intercom makes getting this feedback extremely easy, but no matter how you’re collecting your feedback, make sure it’s an active part of the design process, rather than an afterthought. If you’d like to learn more about how to collect and understand customer feedback, check out these posts.